Packing up the tents and camping gear is a complex process, particularly when everything must be loaded onto the skiff including any extra people not paddling. 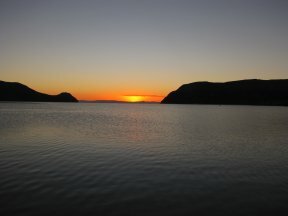 Today we had two choices, paddle on the eastern side toward the mainland or down the Baja side. Everyone opts for the Baja side as it has many coves to explore plus it is four miles shorter. Tomorrow’s paddle will be on the eastern side as our campsite will be on a long sandy beach judged to be one of the best beaches in the world. I ride in the skiff—I think everyone is tired of my handicap but most particularly me! I fall again today—twice, once in the lady’s bathroom trying to balance myself—no handicap bars on the canvas screen! The rock was crumbly and I landed on a small pile of driftwood and hoped that there were no scorpions or biting things in that pile. The second time was getting off the boat-wet with spray—I swung one leg over the rail and then the second and promptly found myself on the beach. Fortunately the sand was squishy wet and relatively soft and all I suffered was a loss of dignity. On the skiff, we stop to dump our garbage and clean out Paco. The sea gulls were thrilled at their breakfast feast, flapping their wings excitedly as they foraged. We stop at another tour site, very fancy with beach cabanas, huge sun showers, walled tents with cots and dressers plus a full size kitchen. Alvaro and Alvarito go ashore and return with sodas, fresh tomatoes and lemons. The food has been wonderful, all cooked on a Coleman camping stove. We’ve had a lot of fish caught that day or day before by Alvarito. Last night we had a fish stew prepared with green peppers and onions with a dessert of sliced bananas and raisins covered with thinned sweeten condensed milk somewhat reminiscent of Indian fare. Breakfast this morning was fresh papaya and fried bagels. The fruit is always so uniformly chopped, I looked for a food processor hidden away, but it is all done by hand. Birds here have been endlessly fascinating to us all. We all watch the pelicans fishing—a clumsy entry into the water and then a right turn flip. The blue footed boobies sit on a ledge above the canyon wall, circle about and then dive straight as an arrow into the water without any splash. A kingfisher scolds as they get too close and occasionally I hear a cactus wren chittering away. Buzzards are on one end of our beach campsite and lunch on puffer fish. Yellow-footed gulls strut back and forth, unique in the world to this place. I find a live puffer fish near shore and we all poke and prod the poor thing, watching it puff up with air. Rob takes hold of its tail and holds it up, amazed at how heavy it was and aghast afterward that the spines he did not touch might have had poison in them. We go kayaking down part of the eastern side of Espiritu Santos and see several sea caves. Glen and I stay outside but Rob and Sue put a double through as does Don. He said it would be heart rate raising adventure which neither Glen or I desired. Glen finds a scorpion under a log near me—all of us calling for Rob who expressed a deep desire to see a scorpion but had been talking to Paco. He poses behind Alvarito who holds the scorpion previously flushed from his hiding place by Glen and Don who was assigned the task of scorpion herder. Rob says he will photoshop the photo with the scorpion being much larger and himself holding the scorpion. Sunset was glorious—again! 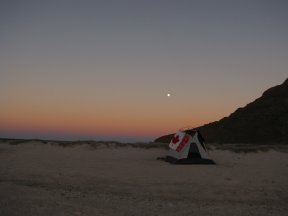 The sky is all orange against purple mountains of Baja; the opposite side toward mainland Mexico is pinky yellow highlighted by a huge nearly full moon. Don points out various constellations and sees a shooting star. Paco is on the east side of the island over a lot of unstable rocks nearly at the water on the mainland side and under a fig tree. There is a catamaran moored there and on each of my trips I focused on its running lights so my path was nearly twice as long as it needed to be. I miss seeing any of the indigenous large black rackets but did not regret not finding snakes on my way. Thanks so much for sharing the whole adventure with us. I loved hearing the sound of the waves on the videos…..
I’m planning to go on this trip with Blackfeather in February and wonder if I could communicate with you directly for any tips you can share from your experience.